I’m back!! I have been so slack in the last few weeks, and I’m going to do something about it. This week I’m planning to do two or three things from “In the Mix” – so watch this space! 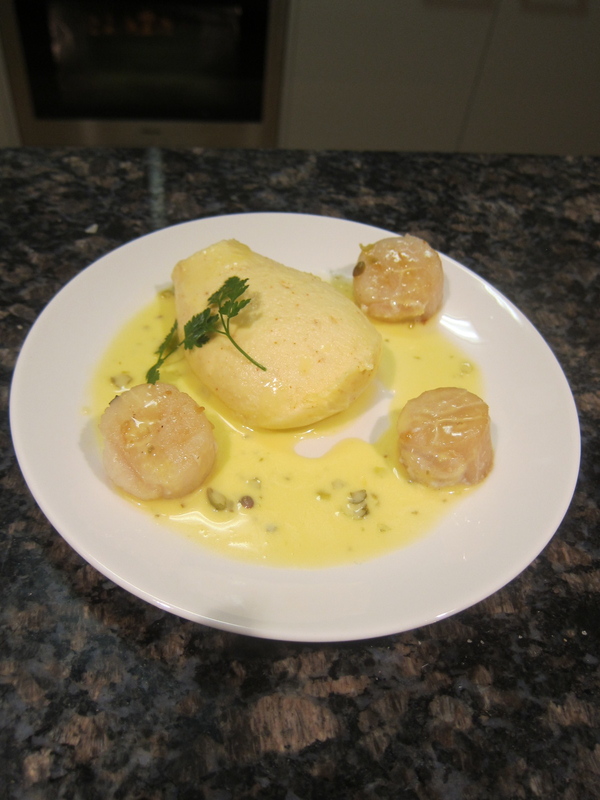 My first recipe this week is the Scallop Mouselline with Lemon Caper Sauce. It’s one of Willie Pike’s recipes – he’s a Scottish Chef. Firstly, I’ve got to say that my presentation of this dish was a fail – so much so I was tempted to bin the lot. I have been assured though, that it tasted so amazing that I can regularly serve it up. 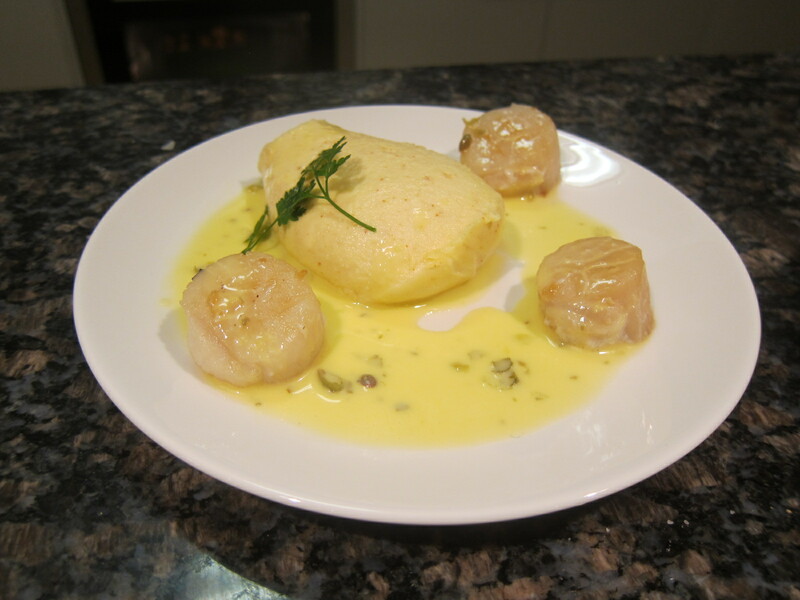 There are a couple of elements to this dish – the Mouselline itself and a really divine Lemon Caper Sauce. If you want to, and I did, you can serve additional scallops with the Mouselline for presentation. I love scallops! Fans of food miles won’t like me, but I bought some Japanese Scallops at the local fish shop, and they were lovely – even if they were frozen. They were sold without the roe – and that sort of makes me sad – I love scallop roe…but it really seems to be out of favour at the moment. It’s not a difficult dish by any stretch of the imagination,I think the hardest part is getting those little suckers out of the dariole moulds in one piece! You’ll need dariole moulds for this recipe, which I have quite a collection of. 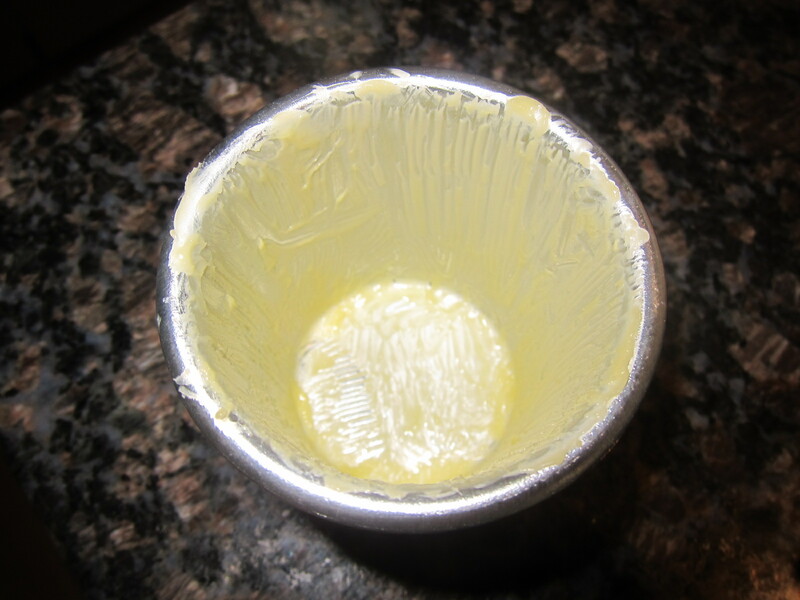 You need to butter them well with melted butter, freeze them, and then add some more melted butter to them before putting them in the fridge. Watch your fingers when you remove the moulds from the freezer – they don’t take long to get really cold and my fingers stuck to them. I had flashbacks of one of our friends licking the metal ice tray when I was about 5. I think Andrew still has the scar on his tongue from that day – more than 35 years later! Also, the recipe says it serves 6, but I had plenty left over from 6 dariole moulds, so I would guess that it you were really nifty with the spatula you could get maybe even 10 from the recipe. My dariole moulds hold 100mls of water, so you might need to adjust your expectations depending on the size of yours. The mouselline requires scallops, which you blitz, egg yolks, an obscene amount of double cream , and then egg whites. You also add cayenne pepper and salt, to taste. I added a generous quarter of a teaspoon of each, and I think the cayenne pepper was just right. It also adds a nice little red speckle to the mouselline, which, when it’s turned out, it also lightly coloured by the butter you’ve greased the dariole moulds with. I wasn’t sure if this was a recipe that you could pre-prepare, so I was a bit flustered getting it all ready for entree for Sunday night dinner. I’m pleased to say I kept one aside in the fridge which I’ve just steamed almost 24 hours later and it was just a nice. I thought I’d see if Master 3 would like it – but it was a bit too much for him – so I had to eat it!! 😉 As it is, you could prepare the Lemon Caper Sauce a little earlier too – maybe a couple of hours before you need it. I’m not sure it would reheat properly because of the cream in it, but if you could stand a room temperature sauce then it would be worth it. The mouselline rises a little in the steaming, so don’t completely fill the dariole moulds. 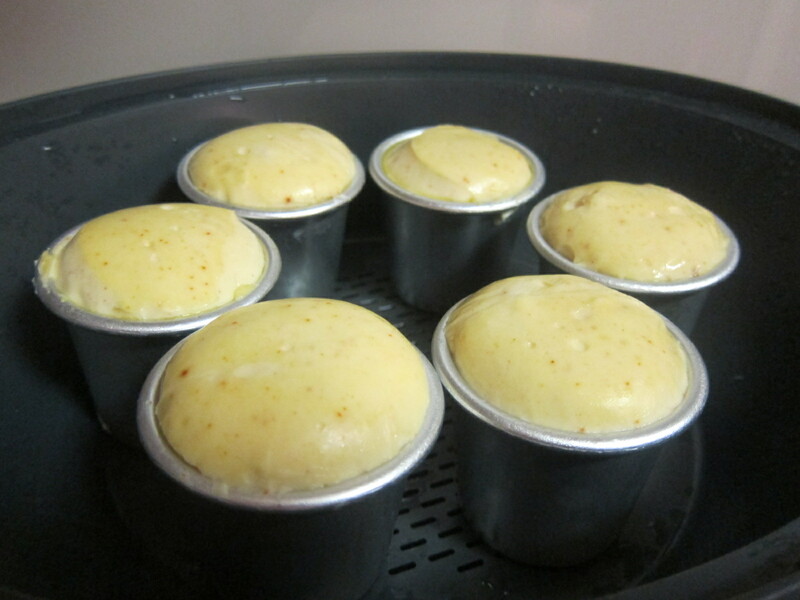 And do make sure you let them cool down a little before turning them out. Mine were really hard to turn out even though they’d been buttered really well. I ran a knife around the edge, but they were a bit blobby, so I think some extra steaming may have been in order. The Lemon Caper Sauce is just delightful. You could serve it with a range of things – steamed asparagus, smoked salmon, prawns, even with scalloped potatoes I think. We even used some of the remains with roast potatoes last night, and it was great – allegedly! I didn’t try – mainly as I had eaten too many potatoes at that stage to contemplate even more. I’m not sure why, but my sauce didn’t look anything like the one in the picture. Mine was almost a bernaise-y appearance in colour, not the clear-ish sauce in the picture. I’ve just had a little spoonful from the leftovers in the fridge, and it still tastes amazing!